"You ain't gonna like what I have to tell you, but I'm gonna tell you anyway. See, my name is Karen Memery, like memory only spelt with an e, and I'm one of the girls what works in the Hôtel Mon Cherie on Amity Street. Hôtel has a little hat over the o like that. It's French, so Beatrice tells me." Set in the late 19th century—when the city we now call Seattle Underground was the whole town (and still on the surface), when airships plied the trade routes, would-be gold miners were heading to the gold fields of Alaska, and steam-powered mechanicals stalked the waterfront, Karen is a young woman on her own, is making the best of her orphaned state by working in Madame Damnable's high-quality bordello. Through Karen's eyes we get to know the other girls in the house—a resourceful group—and the poor and the powerful of the town. Trouble erupts one night when a badly injured girl arrives at their door, beggin sanctuary, followed by the man who holds her indenture, and who has a machine that can take over anyone's mind and control their actions. And as if that wasn't bad enough, the next night brings a body dumped in their rubbish heap—a streetwalker who has been brutally murdered. 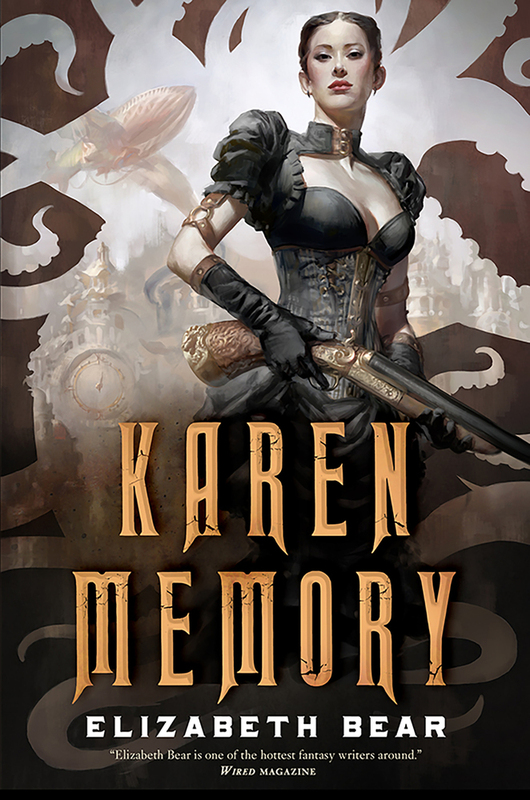 Bear brings alive this Jack-the-Ripper yarn of the old west with a light touch in Karen's own memorable voice, and a mesmerizing evocation of classic steam-powered science. ELIZABETH BEAR was the recipient of the John W. Campbell Award for Best New Writer in 2005. She has won two Hugo Awards for her short fiction, a Sturgeon Award, and the Locus Award for Best First Novel. She is the author of the acclaimed Eternal Sky series. Bear lives in Brookfield, Massachusetts.